This franchise offers a great investment for the absentee owner who prefers to have a General Manager run his business. This is a white collar business management franchise in a blue collar industry with company operations showing five years of sustainable growth. We are seeking prospects looking to scale a business and manage a P & L versus working in the field. We have a national call center that manages all prospective customer inquiries through a toll free number. We educate the customer about our services, give an estimate when appropriate, schedule the job, and route the job through our centralized process. We also award the largest territories. Vehicle financing is available from franchise partners. Our model is adaptable as an owner operator model (not working on truck), transitional model from another career, or straight ROI model with general manager in place running day to day. 2) Business to Business; realtors, property managers, construction trades, builders, etc. 3) Business to Government; Federal, State, Local, School Districts, Colleges & Universities. 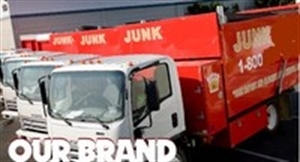 a) We are the Greenest company in the junk removal industry recycling 60% of all items removed from job sites. Our marketing and branding is “green” driven promoting this fact to consumers and businesses. b) We remove recyclables at the job site and deliver them to our warehouses. Recycling vendors remove the recyclables from us and pay us for them thereby allowing recycling to be an additional profit center versus a cost of sales. c) By recycling 60% of the items we remove from job sites allows us to manage more jobs per day which equals more revenue per day per truck than our competition and the highest margins in the industry. Please respond with your full name, address and phone numbers. No students or brokers please. The information contained in this ad does not constitute an offer to sell or award a franchise. Such an offer can only be made in compliance with applicable disclosure laws. Offerings are made by Franchise Disclosure Document only. Location and Facilities: Approximately 1,000 to 1,500 square feet of warehouse / light industrial space for recycling component of business model. Exclusive Territory / Franchise Fee charged at 0.08 per population. Min of 500K but larger options available. Support/Training: Comprehensive training program and ongoing support provided by the franchise. One week comprehensive at company HQ. The junk removal/ recycling industry is in its infancy and has a least a decade of growth ahead of it.